The BBC recently reported (1) that "Vitamin C 'slows cancer growth.' An injection of a high dose of vitamin C may be able to hold back the advance of cancers, US scientists claim. The vitamin may start a destructive chain reaction within the cancer cell." The injection "halved the size" of tumors, and was reported in the Proceedings of the National Academy of Sciences. "Readily achieved"? Then this is important, absolutely vital news for millions fighting or fearing cancer. 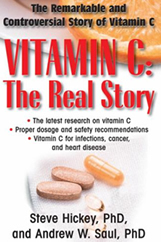 In 1990, American doctors published their results successfully using vitamin C to treat kidney cancer (7). Using 30,000 mg of intravenous vitamin C twice per week, they found that "metastatic lesions in the lung and liver of a man with a primary renal cell carcinoma disappeared in a matter of weeks. Why isn't the public informed about the potential application of Vitamin C in cancer treatment? Why are ACS and Cancer Research UK oblivious to the weight of evidence? All these previous clinical reports were published in peer-reviewed medical journals. One may bear in mind that both ACS and Cancer UK made their restrictive statements August 2008. Yes, 2008. In spite of increasingly compelling evidence for 22 years, both the American Cancer Society and Cancer Research UK are dragging their feet. Foot-dragging costs lives. Hundreds of thousands of people have died from cancer that could have been helped with ascorbate therapy. But for decades, their three advocated cancer treatments have been "cut, zap, and drug": surgery, radiation and chemotherapy. The use of high doses of vitamins has been thoroughly excluded. So what do major cancer organizations have to say? Not much. That is disappointing, but hardly surprising. Both the American Cancer Society and Cancer Research UK have downplayed or flatly ignored decades of physician reports and controlled clinical studies indicating that vitamin C stops cancer. What's worse, each of these supposedly comprehensive cancer research and education organizations continues to actively discourage people from using vitamin C against cancer. Look for yourself and see. The American Cancer Society's vitamin C webpage (3) specifically states: "Although high does of vitamin C have been suggested as a cancer treatment, the available evidence from clinical trials has not shown any benefit." And Cancer Research UK states that "There is currently no evidence from clinical trials in humans that injecting or consuming vitamin C is an effective way to treat cancer." (1) Both organizations are wrong. Neither statement is true. Indeed, ACS still says: "If a supplement is taken, the best choice for most people is a balanced multivitamin/mineral supplement that contains no more than 100% of the 'Daily Value' of most nutrients." (3) That is harmful advice. Many well designed clinical studies show that large doses of vitamin C and other nutrients improve both quality and length of life for cancer patients. The key is the use of sufficiently high quantities, appropriately administered. More orange juice just won't do it. ACS and Cancer Research UK say that there is "no evidence from clinical trials" that vitamin C is any good against cancer. They should start reading the medical literature. They are way behind the times. And they are wrong. Dead wrong. (1) BBC NEWS: http://news.bbc.co.uk/go/pr/fr/-/2/hi/health/7540822.stm Published: Aug 4, 2008. (2) Chen Q, Espey MG, Sun AY, Pooput C, Kirk KL, Krishna MC, Khosh DB, Drisko J, Levine M. Pharmacologic doses of ascorbate act as a prooxidant and decrease growth of aggressive tumor xenografts in mice. Proc Natl Acad Sci U S A. 2008 Aug 4. (4) Lee SK, Kang JS, Jung da J et al. Vitamin C suppresses proliferation of the human melanoma cell SK-MEL-2 through the inhibition of cyclooxygenase-2 (COX-2) expression and the modulation of insulin-like growth factor II (IGF-II) production. J Cell Physiol. 2008 Jul;216(1):180-8. (5) Riordan HD, Riordan NH, Jackson JA, Casciari, J.J., Hunninghake, R, Gonzalez MJ, Mora, E.M., Miranda-Massari, J.R., Rosario, N., Rivera, A.: Intravenous Vitamin C as a Chemotherapy Agent: a Report on Clinical Cases. Puerto Rico Health Sciences J, June 2004, 23(2): 115-118. (6) Riordan HD, Jackson JA, 'Schultz M. Case study: high-dose intravenous vitamin C in the treatment of a patient with adenocarcinoma of the kidney. J Ortho Med 1990; 5: 5-7. (7) Riordan N, Jackson JA, Riordan HD. Intravenous vitamin C in a terminal cancer patient. J Ortho Med 1996; 11: 80-82. Also: Riordan, N. H., et al. (1995) Intravenous ascorbate as a tumor cytotoxic chemotherapeutic agent. Medical Hypotheses, 44(3). p 207-213, March. (8) Riordan NH, Riordan HD, Hunninghake RE. Intravenous ascorbate as a chemotherapeutic and biologic response modifying agent. (9) Murata A, Morishige F and Yamaguchi H. (1982) Prolongation of survival times of terminal cancer patients by administration of large doses of ascorbate. International Journal of Vitamin and Nutrition Research Suppl., 23, 1982, p. 103-113. Also in Hanck, A., ed. (1982) Vitamin C: New Clinical Applications. Bern: Huber, 103-113). (10) Cameron E and Pauling L. (1976) Supplemental ascorbate in the supportive treatment of cancer: prolongation of survival times in terminal human cancer. Proceedings of the National Academy of Sciences USA. 73:3685-3689. Also: Cameron E and Pauling L. (1978) Supplemental ascorbate in the supportive treatment of cancer: Reevaluation of prolongation of survival times in terminal human cancer. Proceedings of the National Academy of Sciences USA. 75:4538-4542. And: Cameron E and Pauling L. (1981) Survival times of terminal lung cancer patients treated with ascorbate. J. Intern. Acad. Prev. Med. 6: 21-27. (11) Hoffer A. High doses of antioxidants including vitamin C do not decrease the efficacy of chemotherapy. Townsend Letter for Doctors and Patients. (13) Moss RW. Antioxidants against Cancer. Equinox Press Inc. Brooklyn NY, 2000. ISBN-10: 1881025284; ISBN-13: 978-1881025283. Also: Moss RW. Questioning Chemotherapy. Equinox Press, Brooklyn NY, 1995. ISBN-10: 188102525X; ISBN-13: 978-1881025252. Riordan HD, Hunninghake, R.E., Riordan NH, Jackson, J.J., Meng, X.L., Taylor, P., Casciari, J.J., Gonzalez MJ, Miranda-Massari, J.R., Mora, E.M., Norberto, R, Rivera, A. Intravenous Ascorbic Acid: Protocol for its Application and Use. Puerto Rico Health Sciences Journal, September 2003, 22:3. To Subscribe at no charge: http://www.orthomolecular.org/subscribe.html. The above provides a general overview on this topic and may not apply to everyone. Any treatment protocol should be discussed with a qualified healthcare practitioner ... Please refer to: Medical & Legal Disclaimer.